†Now at the University of California, Department of Physics, Berkeley, California. Interferometric wavelength measurements of sixty-one copper spark lines in the region 2884 A to 1979 A have been carried out by means of a Fabry-Perot interferometer equipped with 4, 12, and 20 mm spacers. The light source used was a water-cooled hollow cathode Schüler tube operated principally with circulating helium but occasionally with circulating neon. The measurements were employed to establish the 4s and 5s even levels and 4p odd levels of Cu ii. After fixing these low levels, their values were combined with the grating measurements of Carter and Shenstone to establish the values of certain higher odd and even levels. 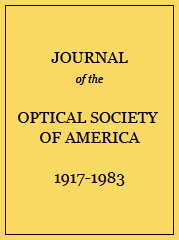 Use was then made of the Ritz combination principle to calculate precise wavelength values of approximately sixty copper lines in the region between 1663 A and 984 A with estimated accuracies which varied from ±0.0003 A to ±0.001 A. Measured wavelength values of Cu ii. a These are the combinations given by Shenstone in reference 1.
b This value was determined from the 4 mm spacer. Spectrograms with the 12 mm and 20 mm spacers suggest that this is a double line, but did not allow reliable measurements. c This is a component of a double line clearly resolved by the 12 mm and 20 mm spacers. Partial combination array for Cu ii. Energy level values of Cu ii. a These are the designations used by Shenstone as given in the “Author” column of A.E.L. (reference 14). b S indicates the value of the 4s 3D3 level determined by Shenstone as given in A.E.L. (reference 14). This level is taken as the reference level for the present work. R and M indicates level value derived from the interferometric measurements of Reader and Meissner. C and S indicates level value based on grating measurements of Carter and Shenstone. Calculated wavelengths of Cu ii lines in the vacuum ultraviolet. a Intensities are those observed by Shenstone (see reference 2). b This line has been given two or more classifications by Shenstone. c This line has been recommended by Wilkinson (see reference 10) as suitable for a provisional wavelength standard. d Shenstone’s intensity may refer to a blend of two close lines.